One of the most impressive games that I had the pleasure seeing at PSX last year was Absolver. The 3D brawler is the first project from Parisian indie developer Sloclap, and it managed to blow me away with just how punishing its combat felt. Something as simple as landing a punch on a skilled opponent felt like a triumph for me, and I adored the PS4 title’s gorgeous art style. While my PSX 2016 preview was all about learning the basics, at E3 I got to jump right into the action. I also got to see how the game’s multiplayer will play out, as players will just bump into each other in the game world. Whether or not this ends up being a cordial relationship depends on the two players, as they can either fight or choose to partner up. Since the person I ran into was the developer that was showing off the game to me, I made the smart call to accept his pact. This is done by popping up the game’s expression menu, which holds a bunch of emotes and also allows players to partner up (or betray their friends if they want). Once I partnered up with a member of Sloclap, I understood just how advantageous it was to have a partner. Facing off against two enemies could be a daunting affair on my lonesome, but it became quite easy when I had an accomplice by my side. My favorite strategy was simply double-teaming a foe, as they’ll be guarding against one of our attacks while the other player attacks them from behind. It’s not the way to win a fight with the most honor, but all is fair in love and war, right? Once I was reacquainted with the game’s unique focus on fighting stances (players can change into four different stances by using the right analog stance), I got to check out the game’s latest fighting style called Stagger. Based upon the Chinese martial art zui quan (regularly referred to as drunken fist style in America), Stagger has the player stumbling around into all kinds of unique punches and kicks. Since the movement is so unique here, it also features many attacks that start in one stance and in up in another. Paying attention to these changes are key for high level play, although that level of depth was a bit beyond me at the moment. After customizing my combos, I got to check out the game’s more traditional multiplayer that had us both engage in some round-based fighting. The first player to get three victories would be declared the victor, and I was teleported from a forest to building that was on the edge of a cliff. While I had fun warming up against the computer-controlled enemies early on, nothing can compare to actually facing off against another human opponent. The battle was pretty slow at first, as both of us were looking to counter the other early on. Since just staring at an opponent isn’t much fun, we eventually began to engage more. While I was able to land some decent blows, it became obvious that there was a skill gap between players. I was wasting too much stamina, and it seemed like I was taking three shots just to land one (which really isn’t a winning strategy unless you’re Mark Hunt). As I mentioned earlier, the multiplayer level I was fighting in was near a cliff. Since I knew I couldn’t beat my opponent by pure skill, I switched to a riskier strategy that revolved around standing by the edge, and then attempting to use my special ability (which is essentially a spinning dodge) to switch positions. I found some success with this, but I never managed to actually get a ring out. I did manage to win one round against the developer, so at least I didn’t get completely dominated. While I lost the one-on-one match pretty decisively, I still came away from Absolver with a smile on my face. Sloclap’s unique fighting game is just mere months away from release at this point, and I can’t wait to start learning all of the different stances. It’s been a long time since I was excited to truly learn a fighting game, as most releases come from a place of familiarity. Sure, I’m not an expert on Marvel vs. Capcom: Infinite yet, but I already knew how to unleash some pretty devastating combos after checking the move list for a minute. 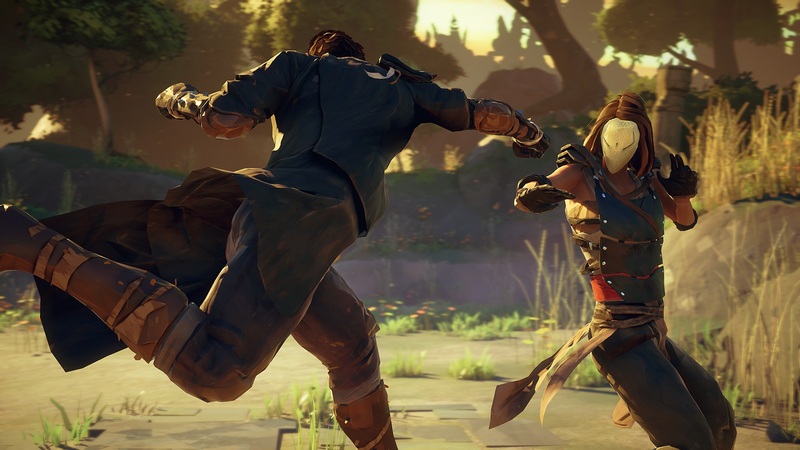 That isn’t the case with Absolver, and that sense of originality is exactly why I’m so excited for it. There are many words to describe the combat in Absolver. The martial arts themselves are often graceful, the impact they deliver is brutal, and from a player’s perspective it’s absolutely captivating. Sloclap is creating a fighting game unlike any other, and the wait for its August 29 release date will certainly test my patience. Absolver is set to release August 29, 2017 for PlayStation 4, and PC. Previewed on PS4.